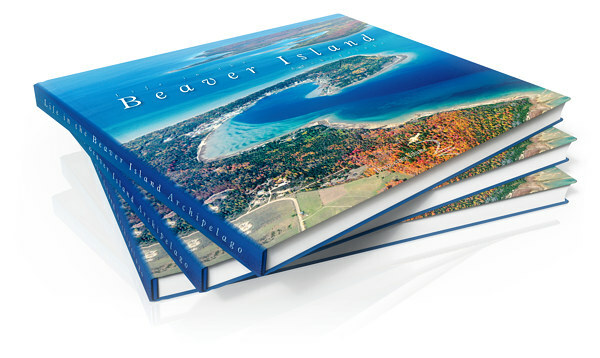 The New Beaver Island Book is here! A great new hardbound book has just appeared, Life in the Beaver Island Archipelago. With 208 12 x 9 pages of lush photos and interesting facts, it should appeal to everyone who loves the Island. Its mix of hundreds of photographs of Island scenes and stories combining amusing anecdotes with historic facts makes it something to turn to, time and again. When readers cannot be here in body, at least they can in spirit. Blending the first decade of the 21st century into a single year, it depicts the shifting seasons, the sweep of color over the forests, the arrival of soft, blanketing snow and the freezing over of the lakes, and the blooming of a progression of flowers. It builds toward the burst of summer activity, the arrival of pleasure craft, private planes, and, most of all, people—what for Beaver Island constitutes the cycle of life. "When you buy this book, you start with the pictures—the lovely places you know so well from different angles and in colors you never saw before. Then you begin to get a sense of the whole: the progression of the seasons, the occasional portrait of Island craftsmen and artists. Eventually, you stop to read the text, and you find there a story of the Island that's easy to read, a mixture of the immediate—the here-and-now—interspersed with history that's amusing and intriguing and contains a multitude of facts you didn't know. Once you start reading Life in the Beaver Island Archipelago, like a thriller, it's hard to put down. It's not just a bunch of terrific pictures, it's a great summer read." Pick up your copy from the Beaver Island Community Center, the Beaver Island Historical Society, McDonough's Market, Livingstone Studio, Island Energies, Shipwreck Shirts, or the Toy Museum. "Here's a phantasmagoria: Photo after photo that leave you awestruck, along with stories, old and new, of the Island, a narrative at once informative and casual, amiable and clear. Get this huge and panoramic book: See the Island you love and discover another world you didn't know."